I Live By The River | A blog about unusual, secret and hidden things to do in London, as well as reviews of its pubs, restaurants and galleries. Daniel Day-Lewis is currently starring in cinemas as former US president Abraham Lincoln in Speilberg’s epic biopic. And it would be a real shock if he didn’t pick up his third Best Actor Oscar for the portrayal. Back in November I read a fascinating article in the Evening Standard where his sister, Tamasin, recounts their childhood together and their relationship with their father, Cecil, who became Poet Laureate in 1968. It is lesser known that the children spent their early childhood in Greenwich and that Cecil was the first President of the Greenwich Society. 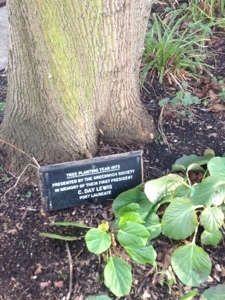 In recognition of his work for them, the Society planted a tree in his honour in 1973 (a year after his death from pancreatic cancer in May 1972). And yet, you could easily hurry past the tree and miss the plaque at its base – especially in the months when leaves carpet the land around it. If you’re in and around Greenwich – perhaps heading to the Park – then spare a second to find the tree planted for a national poet whose son is favourite to soon add to his collection of golden statuettes. We’re back! Man was January intense. A combination of book writing, wedding planning and telescope viewing evenings has meant that we haven’t been able to look after our litle blog very much so far in 2013. However, we enjoyed ourselves so much back in 2012 that we are keen to get back out there and start bringing you the best of London again. I like hot dogs, and I like champagne (a lot). So when a friend suggested a pre-Christmas get together at Bubbledogs, a restaurant serving just that, I was instantly sold. As you can only reserve a table for 6 people or more, we expected a small queue on arrival. However, having arrived at 6pm to find we were just second in the queue, we did not expect to wait for an hour. After finally getting into the warm our expectations were high. The excellent champagne absolutely hit the mark. Unfortunately, the food was very mixed. I had the Buffalo Dog (served with spicy sauce, blue cheese and pickled celery), along with sides of potato tots and coleslaw. While the toppings were delicious the actual hot dog and bun were quite low quality. This was disappointing given that the prices are not cheap (our bill came to £40 pp for hotdogs, sides and 2 glasses of champagne). Conversely the coleslaw was the best I’ve ever eaten, with a perfect balance of creaminess, crunch and zing. The decor – with high tables, stools and exposed bricks – accompanies the food well and helps to create an NYC atmosphere. The toilets, adjourned with vintage menus from classic establishments such as the Fat Duck and Le Gavroche are a nice touch. I have mixed feelings about bubbledogs. On the one hand the food is tasty, the champagne delicious, and the atmosphere is fun. However, the prices are a little steep for the quality on offer and the queues are prohibitive. Overall, I’m not sure I would visit again. It feels a little like style over substance, and I wonder how long the hype and crowds will last. Walking along the foodie’s paradise that is Bermondsey street, its hard to know where to start. Behind almost every door is a tempting restaurant, gastro pub or cafe seeking to tempt the passerby. Not that you can usually just wander in – the growing reputation of the street means its increasingly hard to get a table without a reservation. Zucca, a modern Italian restaurant, is one place well worth making an advance booking. The decor is minimalist and fresh, while the food offers some of the finest Italian cuisine around. Perfectly cooked fish sits alongside rich ragu on the ever-changing seasonal menu – not a pizza in in sight. The highlight of our meal (just) was the starter of crisp ‘Zucca’ fritti (deep fried winter squash)- unusual and incredibly moorish. Get a bowl for the table to share and watch them disappear! Delicious Italian food, friendly service and reasonable prices (for the area). It’s a great place to go for a special occasion, or just a low key lunch if you want to sample delectable treats on offer. Going to the basement of a London pub to spend the night listening to sad songs about lost love and misery might not immediately appeal, especially in this time of Christmas cheer. However, Feeling Gloomy – a monthly club night held at the Phoenix – defies its name to be one of the most enjoyable nights out in London. The ‘club that brings a tear to your eye’ has recently relocated from its original home in Islington, and has lost none of the magic. Created by the infamous Leonard and Cliff, the night celebrates angst ridden indies tunes, and has established a cult following of regulars. Far from being morose, Feeling Gloomy, is a fantastic place to dance stupidly to great music, from Belle and Sebastian and Pulp, to Wuthering Heights and Bright Eyes. Not only is the music great, there’s also a really friendly atmosphere and complete lack of pretension. By the end of the night you’re guaranteed to be dancing with a big group of strangers to ‘There is a light that never goes out’, singing at the top of your voice. If it’s your birthday you’ll even be treated to a chorus of ‘unhappy birthday’ and a slice of Tesco Value cake. Feeling gloomy is completely unique and has a wonderfully nostalgic feel. Whether happy or sad, if you like indie music, you’re guaranteed to leave with a big smile on your smile (and slightly sore feet!). Pizzerias are so ubiquitous these days that you’d think it would be hard to do it a little differently. Fortunately, the folks behind The Big Red in Deptford have managed just that – they’ve set themselves up in a old red London bus. The inside has been converted to provide tables around the retro brown and orange seating. The bus itself is surrounded by a modern and comfy looking terrace. On arrival we were shown to the front of the upstairs of the bus to seats gazing out the front window. In a nice touch from the friendly staff, they double checked whether we were OK with these forward facing seats. We decided to start our meal off with a cocktail and plumped for a mojito each. Whilst they were tasty, they seemed to have been watered down a little to fill the glass and so ended up being a bit thin. Serving them in a smaller glass and not adding the water would have been a better move – a minor point though. Our starter of garlic pizza bread was absolutely lovely. The pizza dough tasted fresh and perfectly cooked with a good hit of garlic. For mains we had the Flemenco (tomato, mozzarella, morcilla and chorizo) and Classic Marinara (tiger prawns, mussels, octopus, squid, cuttlefish, rocket and cherry tomatoes). Despite loving seafood, I don’t normally go for it on a pizza – but then I don’t normally have dinner in a old London bus. I was warned by the waitress that the seafood toppings would be cold, but what I hadn’t counted on was that this would quickly cause the base and cheese to lose heat. But that was my fault and other than that the pizza was top notch. Perhaps the quirkiest and most unique pizzeria in London. Delicious pizza dough that tasted wonderful and avoided the criminal offence of making the cheese on top too greasy. The staff were friendly and informative and the atmosphere inside the bus was really fun. It would be a great place to take a group of mates for either pre or post night out food. You can even hire the whole bus and it would make a cracking location for birthday celebrations. I miss Summer. With the weather getting ever colder I long for the longer days when you can stroll down by the Thames without wearing countless layers. On such balmy occasions there is hardly a finer place in London to sit and watch the world go by than at the Cutty Sark Tavern slightly downstream from Greenwich. A firm favourite of ours, we had never actually been along during the dark months of winter. So when the pub suggested via Twitter that we should come along and try their new venison pie, how could we resist? Whilst we normally sit outside in the summer, winter brings a chance to soak in the beautiful dark wood interior. Sitting upstairs also allows you to gaze out of the window across the water in the same way you can from the benches outside. We decided to go for two starters to split between us: salt & pepper squid, coriander, chilli & lime along with Gressingham smoked duck, heritage beetroot, walnuts and watercress. The starters were nice enough, but didn’t set the world on fire. However, our mains of venison pie were divine. They came out in their own individuals pots complete with lids. Lifting the lid revealed a gorgeous shepherd’s pie but with venison mince instead of lamb. The potato was creamy and smooth and the venison the perfect hearty antedote to the winter blues. I am pretty sure there were even little bits of dark chocolate hidden amongst the filling. My only criticism was that it was a little over seasoned, with the pepper taste a tad too strong. A pub for all seasons. In summer make sure you’re there to sip a cool glass of wine as the sun sets behind Canary Wharf. In the winter move inside to take advantage of the beautiful Georgian interior and their hearty selection of beautifully cooked fare. Earlier in the week Colin posted Part One of our Deptford Mural tour, after coming across the London Mural Preservation Society (@L_MPS), an organisation seeking to protect London’s fantastic murals. Here I’ll tell you about two more of the murals we came across in Deptford. Partially hidden by a row of council bins, the third mural we saw looked a little shabby to begin with. However, on closer inspection the ‘Pink Palace’ mural has a wealth of interesting detail. Created in 1983 by a group of artists and local residents, the mural is the pink facade of a house, with images of cherubs framing the top of the building. It is these cherubs that provide the intrigue. Far from angelic, these creatures are pictured as swigging gin, another reading the Beano, and a third posing as ‘Mr Universe’. For this reason this mural was absolutely my favourite. The final, and largest mural, named ‘Love Over Gold’, was painted in 1989. It was commissioned by Dire Straits (who grew up in the area). The creation of the mural, led by Gary Drostle, involved local primary school children. It depicts issues relating to wealth, disability and equality, and includes an especially moving poem written by a 9 year old child, depicting the “tall tower blocks, cold and grey” in the area. These murals are important, not only because they add vibrancy to the area, both also because they distil messages of struggle, warmth and humour into the streets of Deptford.